CARMEL, Calif. – June 7, 2016 – Automotive Fine Arts Society (AFAS) member Charles Maher will debut two new paintings depicting vintage Bugatti motorcars and classic Brough motorcycles at the 2016 Pebble Beach Concours d’Elegance® on Sunday, Aug. 21, from 9:00 a.m. to 4:30 p.m. His pieces will be part of an exhibit sponsored by The Lincoln Motor Company on the 18th fairway of Pebble Beach Golf Links in beautiful Pebble Beach, California. Maher is known for using a wide variety of styles and mediums, including watercolors and oils, to achieve a stunning outcome. This year, he put his talents to work honoring two famous European marques. Staged on the beautiful grounds of the Concours of America at St. John’s, Maher’s first work is titled “Remains of the Day.” This gorgeous setting with a hint of shadows and stroke of dusk features two sleek 1937 Bugatti Type 57’s enveloped by serene greenery. Set in the late afternoon light after all the other vehicles have left the field, this 14” x 50” acrylic on canvas illuminates the elegant Bugattis waiting for their owners to collect them. 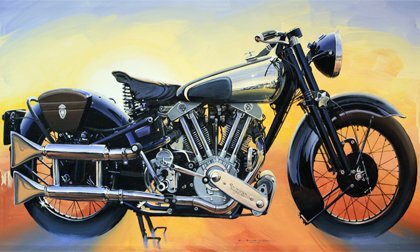 Another Maher masterpiece on the way to Pebble Beach is titled, “Brough.” Maher’s sunset-colored brushstrokes add warmth and radiation to reveal the exquisite detail of the brightened 1938 Brough Superior SS100 all the way down to the V-twin engine. Adding a historical layer to the piece, T.E. Lawrence, famously known as Lawrence of Arabia, was riding a Superior SS100 at the time of his death. Maher grew up in Miami, Florida. Destined to work with cars, he began his automotive journey at the wheel of his family’s 1955 Chevy Bel-Air and a Chrysler 300. He earned a bachelor’s degree in Fine Art from the University of Notre Dame in 1968.